A native-new Yorker, Andrew works in the Support department, serving as Operations Quality Manager. In addition to providing customer support and training new staff, he also plays a crucial role in BuildingLink set-up and implementation for our new customers. Q: Where are you from and why did you come to NY? A: I spent a lot of time in Westchester, but now I live in Queens. I came to NY because, well… I was sort of born here! Q: What was your most interesting job? A: Working for World Wrestling Entertainment in the marketing department. When I wasn't taking phone calls from fans, I was facilitating meet-and-greets between kids and wrestlers (usually organized through the Make-A-Wish foundation). I was also security one night for a female performer during a non-televised event, at which time a married professional wrestler tried hitting on her and threatened to kill me if I didn't walk away. But I stayed… and fortunately lived to tell the tale. Q: Just for the record, how tall are you? Q: Kudos! So how long have you been at BuildingLink? A: Three years, give or take. Q: Most people here have a creative side. Do you? What is it? …I guess you just had to be there. A: I'd be a snake because my bite is worse than my bark. Q: If you had to write an autobiography, what would you title it? A: I'm a Snake. My Bite is Worse than my Bark. Q: What's your horoscope sign? Attributes include earthy and stubborn. I’ll let you figure it out from there. Q: Why BuildingLink? What is your favorite thing about working here? A: See, just like that! BuildingLink automatically organizes your residents by floor and line! Water shutdown on the B line? With our "Send Email" tool, you can choose to send to "Occupants from specific floors and lines" and then select only the B line. That way, you get the right information to the right people, with only one extra click! 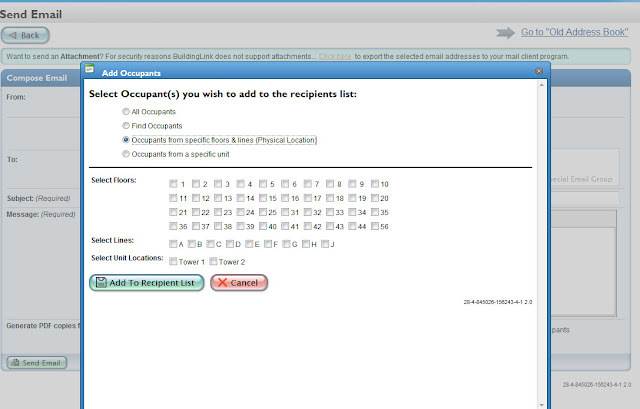 You can also search residents by floor and line with the advanced search feature in our resident directory. Happy Thanksgiving from all of us at BuildingLink! Demand for luxury condos is rising, say Prashant Gopal and Katie Spencer in their Oct. 20th Bloomberg Businessweek article. And with that comes the demand for a seamless organizational system that allows both management and buyers to get their daily needs addressed (and so much more! ), say all of us at BuildingLink. Using the latest technology, BuildingLink software goes hand and hand with luxury: is it any coincidence, then, that the two buildings featured in the article linked below (the Edge and 80 Metropolitan) are both BuildingLink buildings? For more information, check out Gopal and Spencer's article Brooklyn Home Sale Jump 18% as Buyers Seek New-Condo Deals. The independent media company Sustainable Industries is hosting a free webinar entitled "Commercial Buildings: So Much Greening To Do, So Little Time." It will take place on Nov. 3rd at 1 p.m., and is aimed at property managers, among others. Since so many BuildingLink customers have already shown a committment to the green movement by adopting our paperless system, we thought this might be of interest! For more information or to register for the webinar, click here. Not only can you keep track of residents, packages, keys, laundry, visitors, contractors, maintenance requests, amenity reservations...(wow the list goes on and on! 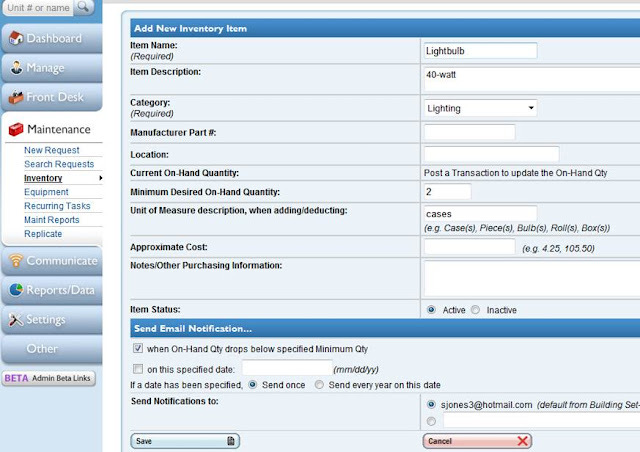 )...but you can also use BuildingLink to keep track of equipment (like the items pictured on the left), generate inventory reports, and even set-up automatic alerts for when you are below the minimum quantity of lightbulbs, filters, mops, etc. Need help getting started? Give us a call and one of our support staff will be more than happy to assist you. 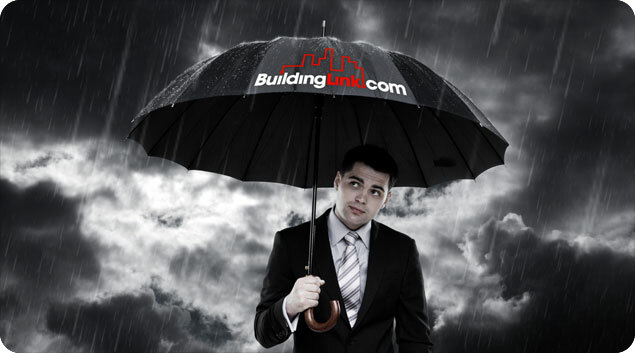 Check out our latest newsletter about BuildingLink and Hurricane Irene. Click here to view. Resident Passports - FAQ's about our new program! What kind of material are the cards made of? 30-mil thickness laminated plastic printed in full color on the front, and in black and white on the back. It feels and looks great - like an upscale store credit card. How does the Resident Passports printing work? The printing occurs directly from the resident data that you keep in BuildingLink. We have invested nearly a year in making this technology work. It required creating a special program that can automatically pull from the BLK (that's "BuildingLink" for short) online database and translate the data into the specialized print codes that a high-end card printer requires. So what do I need to get? Nothing, but remember that we can only print from data in the BLK database. So if you want things like resident photos, move-in dates, lease expiration dates, or owner/sublet /board member statuses reflected on your passports, you'll need to make sure to enter or upload that info into BuildingLink. How do I get my resident photos uploaded into my residents' BuildingLink profiles? The easiest way is via the Quick Lookup screen, which provides a direct link to uploading a photo or capturing one with an attached web cam. Alternatively, you can capture the photo by purchasing our driver's license scanner and choosing the scan option of "extract photo only." Is there a way to see which residents have or are missing photos? Yes, two ways. Firstly, in the Resident Directory. Secondly, on the Site Activity report screen. How do I go about choosing a design for my property's cards? We will be adding a picture gallery page of card styles that have already been created, to get you started, and our graphics and programming depts. will finish the design with you. Or if you prefer, you can start from scratch and implement that special design that only you have thought of. What additional card features can be added? We can print a unique barcode ID (usually looks nicer if printed on the back) and/or encode it into the card's magnetic stripe, so that you can utilize various BuildingLink screens to scan in or swipe the card. The most basic use would be to confirm the resident's identity and his/her status as a current resident. Can my Passport cards work with my existing or planned access control system? In many cases, yes, if we print them on Prox cards. In the “Prox Card” Access Control world, there are basically two different standards and two different card types that are compatible with almost all systems. The lower frequency cards are 125 Khz, and the higher frequency (Milfare) cards are 13.56Mhz. See Wikipedia - Proximity Cards . Both of these cards are available in a blank, printable version, such that we can print your Passports right on them.If you give us more info on the card or FOB you are now using, or if you send us one, we can tell you which format your system uses. We can also print Passports onto special adhesive-backed PVC cards that can be attached to the outside of your existingcards, if you already have Prox cards deployed at your facility. How do I print my property's cards? You don't. That's the beauty of this program. We have invested in the special equipment needed to produce the Passport cards, so you don't need to bother with the expense, maintenance issues, and ribbon supplies required. We like to say, "We do the work. You take the credit." Can I print my own cards locally? This will eventually become an option, if you choose to purchase your own, compatible laminate card printer, though the quality won't be quite as good if you print them on the typical entry-level $2k-$4k priced printers. We will have to make some modifications to our proprietary printing software to allow it to be installed at your location. But it will eventually (sometime over the next year) become your option. How do you know which cards to print? We initially print a batch of cards for all residents or just for the ones you ask us to. What about reprints of lost cards or prints of cards for new move-ins? How do you know what and when to print? We currently have setup our proprietary to scan the BuildingLink database to see if you have flagged any residents who need reprinting, or if there are new residents who have moved in. Our current plan is to check every two weeks, and then print and mail the new cards to your property manager for distribution. Can I also ask you to print cards for employees? So what is the cost to us for a Resident Passport? We think that $5 per card is a reasonable fee, to cover the expense and programming needed to create these personalized cards. This may change over time. We are currently offering BuildingLink customers the option to have us print cards for all current residents at NO CHARGE (our way of saying "thanks" for being our customer! ), and to pay only for replacements of lost cards, or for new residents' cards. We are not yet sure if we can continue to provide the initial batch for free - but we will try to. Also please note that if you want us to print your Resident Passports on ProxCards, you will need to absorb the cost of providing us with the blank Proxcards to print on. Prox Cards typically cost $3-$7 each. You can either supply them to us, or we can purchase them for you. How does the Resident Passport interface with BuildingLink's "Advantage" program of special offers and discounts? Can the Resident Passport program be set up so that Passports can be used on site to pay for miscellaneous facility usage or amenity services charges? Yes, but that's a discussion for a separate blog post. We're not there yet. Can the Resident Passport program be set up as part of a resident retention program, to award loyalty points or prizes to residents? Yes, but that too is a discussion for a separate blog post. We're not there yet. Can the Resident Passport be used in conjunction with BuildingLink's new Geo handheld, to confirm resident identity in the "field"? Yes, either through the Geo's laser barcode scanner, or through its magnetic stripe swipe reader. Have you thought of other helpful uses for the Resident Passport? Yes we have (voting, signing up for exercise classes, buying newspapers from the front desk, for example). We are still thinking, and planning. If you have any interesting ideas for extending the usefulness of your Passport program, we'd love to hear from you! Okay, I know enough already. I want in! What do I do now? Call us at (212) 501-7117 or email us at passports@buildinglink.com and we'll get you started. (1) The lever switch that determines whether a drawer is in the "opened" or "closed" position has been replaced with a button switch, which we think will eliminate the occassional need for recalibration. We are able to retrofit series #1 drawers with these switches as needed. (2) The main cable connecting the pull-out drawer (that holds the keys) to its outer casing (that holds the power supply and PC interface) has been redesigned so that it can be completely unhooked. This allows you to separate a drawer from its case, to easily service or replace a drawer without upsetting the stack of drawers and PC that may be resting on it. If you ever find yourself pondering the big questions in life, like "What makes BuildingLink work?” or “How tall is my favorite technical support person?” or “Can I borrow Jerry’s Robot?” (we’ll explain later—the robot deserves its own blog post), please VISIT US. If we can’t make your visit fun, no one can: We've got musicians, artists, writers, teachers, programmers and all sorts of talented people. We've also got gadgets aplenty--Geo, Keylink, and of course, that Robot we mentioned. So if you want answers, want to chat, or just don't feel like paying for your morning coffee, stop in anytime (85 Fifth Avenue at 16th Street) for machines, caffeine, and company! We LOVE what we do. (Yeah, we're that sensitive.) Perhaps passion and web-based platforms don't seem like an ideal mix, but in honor of Valentine's day, we're showing our emotional side. We came across a very engaging poetry blog - complete with a section on technology! Check it out here. We're almost sold out of our first production run of KeyLink by BuildingLink. What does that mean? It's just another example of how committed we are to always improving upon a product that people rely on. Interested in learning more about KeyLink? Click here. Take a look at our demo, product specifications--there's even a pricing calculator! You can check out our farthest install to date or how how many systems are in operation in various buildings across the country. And yes, there's still a waiting list.